30162. (North­ern Cree Singers) Dance Hard! Those of us who admire a wild and irrev­er­ent spir­it in music have long looked to Charles Ives (1874–1954) as our patron saint. With his mul­ti­met­ric chaos, his noisy brass bands, cheer­ful mix­ing of pop­u­lar and clas­si­cal themes, his tem­po­ral dys­syn­chronies and his star­tling flights into the infi­nite, he ful­filled every require­ment for an eccen­tric genius ahead of his time. And he was pro­found­ly, quin­tes­sen­tial­ly Amer­i­can. But he was lit­tle known in his life­time. The bulk of his com­po­si­tions were writ­ten then tucked away, unper­formed, in a New Eng­land barn while he pur­sued a more suc­cess­ful career as an insur­ance sales­man. He also pub­lished pam­phlets advo­cat­ing what we would now call “direct democ­ra­cy” and got into a heat­ed argu­ment with a young Franklin Roo­sevelt over his idea of pro­mot­ing gov­ern­ment bonds cheap enough for the ordi­nary cit­i­zen. But it was not until the 1960’s that his works were fre­quent­ly played, and his name became famil­iar to clas­si­cal musi­cians and lis­ten­ers. Much of this change came about through the ardent advo­ca­cy of con­duc­tor Leonard Bern­stein. It is pos­si­ble to lis­ten to a per­for­mance of Ives’ Sym­pho­ny #4 today and expe­ri­ence it as “mod­ern, avant-garde music” even though it was com­posed in the 1910s! (It wasn’t per­formed until 1965). But fas­ci­nat­ing as Ives is, he is not alone in the sto­ry of Amer­i­can music. Anoth­er com­pos­er, liv­ing a full cen­tu­ry before him, shared many of Ives’ char­ac­ter­is­tics. 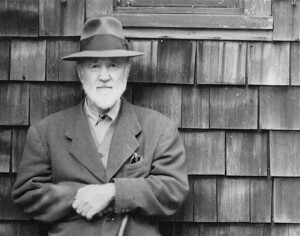 Like Ives, he was self-taught, eccen­tric, exper­i­men­tal and ahead of his time. Like Ives, he wore his patri­o­tism on his sleeve, loved loud nois­es and order dis­guised as chaos, and was drawn to tran­scen­den­tal themes. He died 13 years before Ives was born, and Ives prob­a­bly nev­er heard of him. Unlike Ives, how­ev­er, he has found no high-pro­file cham­pi­on. His works are played only occa­sion­al­ly and few peo­ple have heard them. The man in ques­tion was Antho­ny Philip Hein­rich. He was born in 1781, in the north­ern­most vil­lage of Bohemia, in what was then a pre­dom­i­nant­ly Ger­man-speak­ing part of that land. Like Ives, he pur­sued a suc­cess­ful career as a busi­ness­man, rel­e­gat­ing music to a hob­by. But the Napoleon­ic wars ruined him, and he found him­self pen­ni­less in Boston in 1810. He plunged into a new life enthu­si­as­ti­cal­ly, deter­mined to be a wan­der­ing musi­cian on the open­ing fron­tier. He trav­eled most­ly on foot, liv­ing rough, through Penn­syl­va­nia, Ohio and Ken­tucky. This expe­ri­ence instilled in him a pro­found love of nature and an ide­al­is­tic patri­o­tism for his adopt­ed coun­try. Final­ly he set­tled in a log cab­in in Ken­tucky and began to com­pose. Amer­i­ca as yet had no real sym­pho­ny orches­tras and few trained musi­cians. His larg­er com­po­si­tions could only be played in Europe. Even­tu­al­ly, he par­tic­i­pat­ed in found­ing the New York Phil­har­mon­ic, and achieved some pub­lic suc­cess, but this quick­ly fad­ed, and he died, reduced again to pover­ty, in 1861. His music not only drew on Amer­i­can folk music and on the melodies and rhythms of Native Amer­i­cans [Comanche Rev­el; Man­i­tou Mys­ter­ies; The Cherokee’s Lament; Sioux Gal­liarde], but it was sat­u­rat­ed with the sig­na­ture ele­ment of Amer­i­can music: impro­vi­sa­tion. Musi­col­o­gists would no doubt clas­si­fy him as his century’s most con­sis­tent prac­ti­tion­er of musi­cal inde­ter­mi­na­cy. Bird song filled his music, which often sport­ed spec­tac­u­lar­ly grand ornitho­log­i­cal titles: The Columbi­ad, or Migra­tion of Amer­i­can Wild Pas­sen­ger Pigeons and The Ornitho­log­i­cal Com­bat of Kings. Per­haps the piece that sums him up is the vocal/orchestral suite, The Dawn­ing of Music in Ken­tucky, or, the Plea­sures of Har­mo­ny in the Soli­tudes of Nature. Noth­ing he com­posed fol­lowed the musi­cal con­ven­tions of Europe. 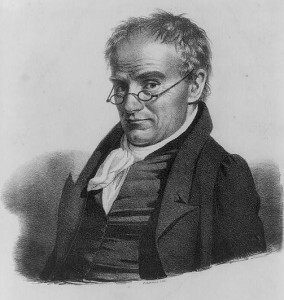 Alto­geth­er, I’ve heard 18 of his works, and all of them gave me plea­sure, while some of them seemed to me both rad­i­cal and pro­found. In oth­er words, the qual­i­ties that drew me to Ives were present in Hein­rich a cen­tu­ry before. It’s impor­tant, in this dark time for Amer­i­ca, to remem­ber that the nation that has sunk to the lev­el of elect­ing a scur­rilous con-man, crim­i­nal and trai­tor to its high­est office has in the past, over and over again, nur­tured cre­ative men and women imbued with the spir­it of lib­er­ty, and will no doubt do so again. At this moment, I’m lis­ten­ing nei­ther to Ives nor Hein­rich, but to a coun­try-rock album from 1968, The Wichi­ta Train Whis­tle Sings. It’s by Mike Nesmith, remem­bered most­ly as being one of television’s Mon­kees, but actu­al­ly a man of var­ied tal­ents. You can hear many ele­ments of Hein­rich and Ives bub­bling through this almost, but not quite for­got­ten album. And they are bub­bling in many works by singers, com­posers, garage bands, rap­pers, and elec­tron­ic artists today. To use anoth­er Mike Nesmith album title: And the Hits Just Keep On Comin’. Kur­dish band Nish­ti­man per­formed their sec­ond album “Kobane” Toron­to, Cana­da, Sep. 29, 2017. 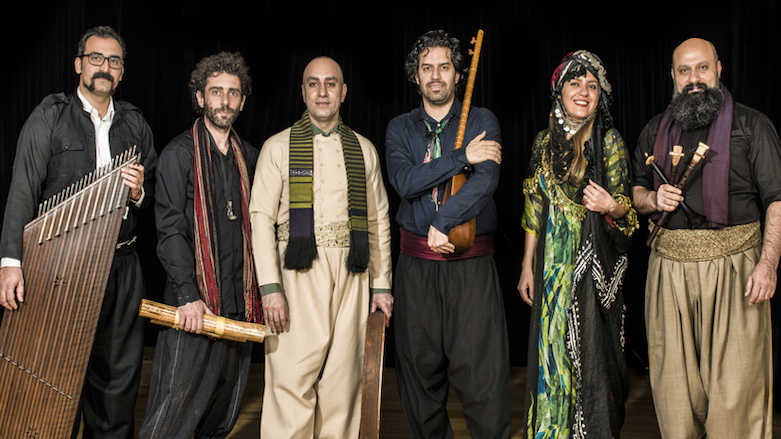 The band unites musi­cians from the dif­fer­ent Kur­dish com­mu­ni­ties of Iraqi Kur­dis­tan Iran, and Turkey. For a pedi­gree of musi­cal con­ti­nu­ity, you can’t beat Kur­dis­tan. The old­est known nota­tion of music dates from the ancient Hur­rian king­dom, in the sec­ond mil­le­nium BC. Two sacred hymns recov­ered by archae­ol­o­gists from that ancient civ­i­liza­tion, locat­ed in the heart of today’s Kur­dis­tan, are in the same mode and bear a vis­i­ble kin­ship to the Kur­dish folk music of today. The mod­ern Kur­dish folk move­ment is frag­mented: vari­ant scenes in Iraqi Kur­dis­tan, Iran, Syr­ia, or Turkey, as well as a Kur­dish dias­pora in Europe and North Amer­ica. In Turkey, singing in the Kur­dish lan­guage was against the law, pun­ished by impris­on­ment and phys­i­cal abuse, until very recent­ly. In Iran, how­ever, it thrived, and in new­ly self-gov­ern­ing Kur­dis­tan, I’m sure it must be under­go­ing quite a renais­sance. Oth­er than a few stray pieces on gen­eral col­lec­tions of mid­dle east­ern music, the only record­ings I have are one by instru­men­tal­ists Tah­moures and Sohrab Pour­naz­eri, with accom­pa­ny­ing vocals by Rojan, enti­tled sim­ply Kur­dish Folk Music, and a cd called Kur­dish Dances fea­tur­ing Moham­mad Bhamani on dozak and sornâ, ‘Abdol­lâh Nabi­ol­lâhi on dobol, and vocals by ‘Abdol­lâh Qor­bâni. But I heard a mar­velous live con­cert last year, at the Agha Khan Muse­um in Toron­to. The first thing that strikes the lis­tener is the music’s acces­si­bil­ity. The melodies are catchy and upbeat, and not buried in the micro­tonal intri­c­as­ies and melis­ma that makes it hard for out­siders to fol­low mid­dle east­ern music. You could eas­ily par­ty to this music, in a mod­ern dis­co, though it is pure­ly tra­di­tion­al.